Annaka Samurai Nagaya House (旧安中藩武家長家) is a remaining original Samurai apartment. It was built in late Edo period. There are 4 residential spaces in this Nagaya Style House. Low tank Samurai lived in this house. 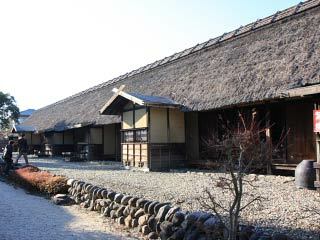 This house was located to south side of Annaka Castle. It was for protection of the castle in case of war. Admission: 210 yen for adult, 120 yen for kids. There is a group discount. Open: 9:00 to 17:00 (last entree 16:30) From Dec to Feb close 30min earlier. 1. use JR Shinetsu Line to Annaka. Annaka Samurai Nagaya House is one of very few remaining original Samurai House that takes Nagaya style building. Nagaya is a large long apartment. Several numbers of Samurai families shared the house. Each residential spaces are divided, and each rooms has kitchens and Doma. They share well and restroom. Samurai Nagaya House of Annaka has 4 residential spaces. 3 spaces remains in original and reconstructed another one to recover to the original building. It is 47.32m wide and 5.46m deep. Each residential space has 2 rooms, kitchen and doma. This building was shared with low rank Samurai.